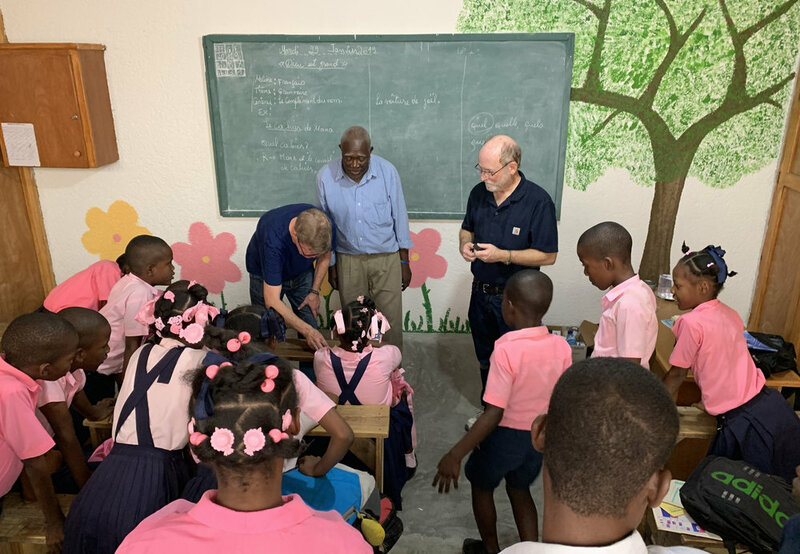 “Humble” was the first word that came to my mind as our team arrived in a Haiti preschool classroom to find 50 preschoolers sitting on wooden benches to learn vowel sounds. Hundreds of school children from some of the poorest communities and villages gather in the five Harmony Ministry schools across that country. The largest school is in the slums of Port au Prince where 200 students learn in the brand new school building rebuilt following the 2010 earthquake. Three village schools with about 50-150 students at each and a small preschool through first grade, high in the mountains, complete the Harmony Ministry schools. Many of the village students are the first in their family to learn to read and write. Children walk or ride tap-taps (mini buses) for several hours each day to attend school and for most, they go without lunch each day. Seeing this, I reflected on how different my elementary school experience was from the children in Haiti. My classrooms were filled with bright bulletin boards, fun ways to learn math, reading, writing and science. My favorite place was always the well-stocked library where I picked a new book to read each week. My well educated teachers prepared for us to have new experiences. We had daily recess on new playground equipment. I was blessed, even more than I realized, as I watched the older children learn their times tables on the one blackboard with a tiny piece of chalk in their hand. The focus of this Haiti trip was on two schools. The newly finished Port au Prince school with nine classrooms from preschool to sixth grade and the small school in the village of Thoman near the Dominican border. During our week we wanted to provide a few experiences for the students that they might not otherwise have. We provided color and brighter rooms for the classrooms in Port au Prince, took their photos [which likely had never been done before], and taught science and art classes. The painting project was started by the Harmony Ministries community as they painted the walls white. We arrived to decorate with painted trees, stripes, polka dots, rainbows and handprint flowers made by the students in the classes. Their excitement upon entering their painted rooms was joyful to watch as they compared their classroom decorations with other rooms on Monday morning. But the most powerful experience was our team’s interaction with the students as we taught art and science lessons. Many children had never looked in a mirror as our team member talked about how we are all unique, special and loved by God. Children learned how to draw a face, use scissors and crayons, and share some of their favorite things that make them special. We were humbled when they wanted to share their photos with our Sunday school children. Their eyes opened wide as they saw yellow and blue make green in our science lessons. As they learned the power of magnets that can attract each other through our hands. And air mass with paper helicopters thrown off the second story balcony or into the windy street. Their energy brought joy to our faces and humility to how much we have and know from our privileged education in the states. Finally, as we took individual photos the group would gather around as they watched the 2 x 3 photo come out of our Polaroid camera. They laughed, smiled and wanted one to take home. We have school photos of ourselves, children and grandchildren. It was humbling to recognize this might be their only school photo. The photos were put up on each classroom wall so everyone could remember how special they are. Often we forget about the small energizing opportunities that led us to choose careers, passions and vocations like an art class or a science experiment. Many road blocks are against these children as they think about their future. I am humbled by how blessed we are here, and challenged to provide more experiences like these to our partners in Haiti.